When you step into your home in the brand new tower at Creek Vistas, Sobha Hartland; you know you've stepped into the higher life. Inspired by the minimalist design of architectural greats like the Louvre and the Museum of Modern Art, the meticulous craftsmanship and sleek interiors will delight your aesthetic sensibilities. The world-class amenities o­ffer you every comfort you could dream of. And spectacular, uninterrupted views will take your breath away. This 28-floor tower of luxury residences guarantees a vista of the serene Ras Al Khor Wildlife Sanctuary, Dubai Canal, Downtown Dubai and Dubai Creek. Add to that the acres of green estate that envelope the property and you have a view you can't get anywhere else in the city. Enter Creek Vistas by Sobha Hartland and feel the stress and demands of the city melt away. But more importantly, live here and discover that there’s absolutely no need to step out. The North London Collegiate School and Hartland International School offer the finest education to the little ones. The most sought after brands vie for your attention at our expansive shopping arena. Two top international schools are within walking distance. City leisure living with amenities including gym, swimming pool and dedicated kids play area. An elegant foyer to welcome residents and guests. Fully-fitted kitchens with superior quality and semi-furnished apartments with built-in wardrobes. Central air-conditioning, automation technology and entertainment connectivity. 24-hour security and concierge service ensuring a safe and convenient living space for all residents. 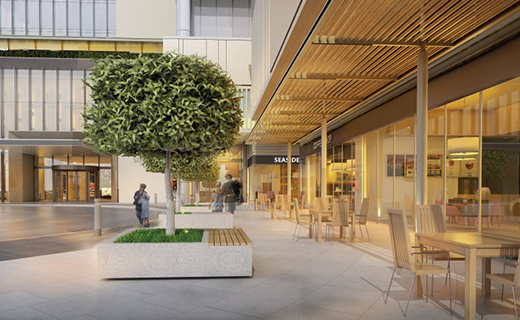 Various dining and retail outlets, hotels and shopping malls planned within the community. Nearest freehold community to Downtown Dubai and other Dubai landmarks and attractions. Master craftsmanship with luxury finishes and elegant, natural colours. Classic minimalist design, contemporary architecture with straight sleek lines. Units built to superior specifications, finest flooring and high-end quality fixtures. Floor-to-ceiling windows, allowing in natural light to create a modern ambience. The state-of-the-art living room, kitchen and bathrooms come with Sobha signature quality. 4 types of unit floor plans with 4 types of views to choose from.